Dewey Balfa performing in 1977. 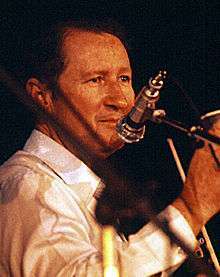 Dewey Balfa (March 20, 1927 – June 17, 1992) was an American Cajun fiddler and singer who contributed significantly to the popularity of Cajun music. Balfa was born near Mamou, Louisiana. He is perhaps best known for his 1964 performance at the Newport Folk Festival with Gladius Thibodeaux and Vinus LeJeune, where the group received an enthusiastic response from over seventeen thousand audience members. He sang the song "Parlez Nous à Boire" in the 1981 cult film Southern Comfort, in which he had a small role. Dewey Balfa was born in Grand Louis, Louisiana, a small community west of Mamou. He was the son of Amay (née Ardoin) and Charles Balfa who were sharecroppers. Dewey had learned most of his songs from his grandmother and father who was a fiddle player. During World War II, Dewey worked in a shipyard in Orange, Texas. After returning in 1948, he and his brothers Will and Rodney formed the Musical Brothers. In 1965, he formed The Balfa Brothers after an enthusiastic response from a performance at the Newport Folk Festival. This led to their first LP, produced by Swallow Records. Dewey Balfa married Hilda Frugé when he was 22 in 1949. They had five children together: Nelda, Roberta, Norma, Dewey Jr., and Christine. Many of whom became musicians. Christine founded the band Balfa Toujours to continue the family tradition. "We are here to tell you a little bit about what a Cajun is. A Cajun is a person who his homeland was France. Went into Nova Scotia, at the time Acadia, and settled there and was there for about a hundred years, and afterwards the British took over the territory and then the French-speaking people, the French descendants, known as the Acadians, came down to the South-Western part of Louisiana, and that was back in 1755. So over all of these years, your language, and your music has been preserved from daddy to son or daddy to daughter or momma to daughter." 1 2 Savoy 1984, p. 236. ↑ "Dewey Balfa and the Balfa Brothers". Retrieved 2009-10-16. ↑ Savoy 1984, p. 237. 1 2 Savoy 1984, p. 239. ↑ Savoy 1984, p. 241.